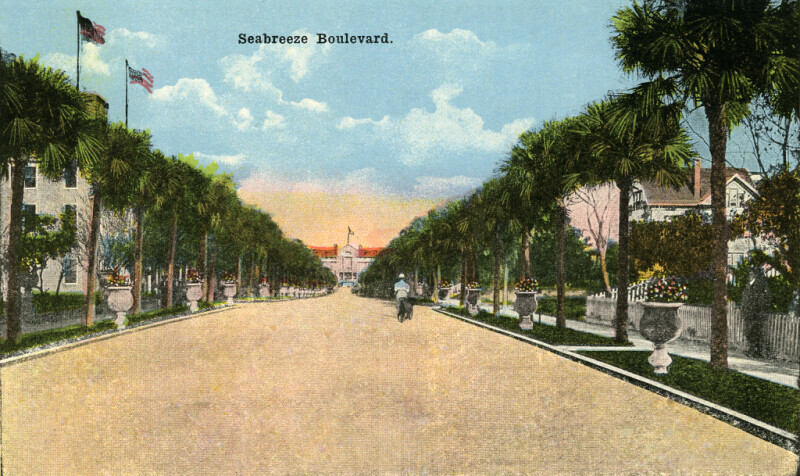 Seabreeze Avenue is a wide, tree-lined thoroughfare. Although the road is at least four lanes wide, the only vehicle seen is a single bicyclist. The trees are uniformly plated sabal palms. There are also a number of evenly spaced, white, pedestaled plant pots with flowering plants growing in them. At the far end of the road, there is a large, white building with an orange roof. There are two American flags being flown from the roofs of house on the left side of the road.